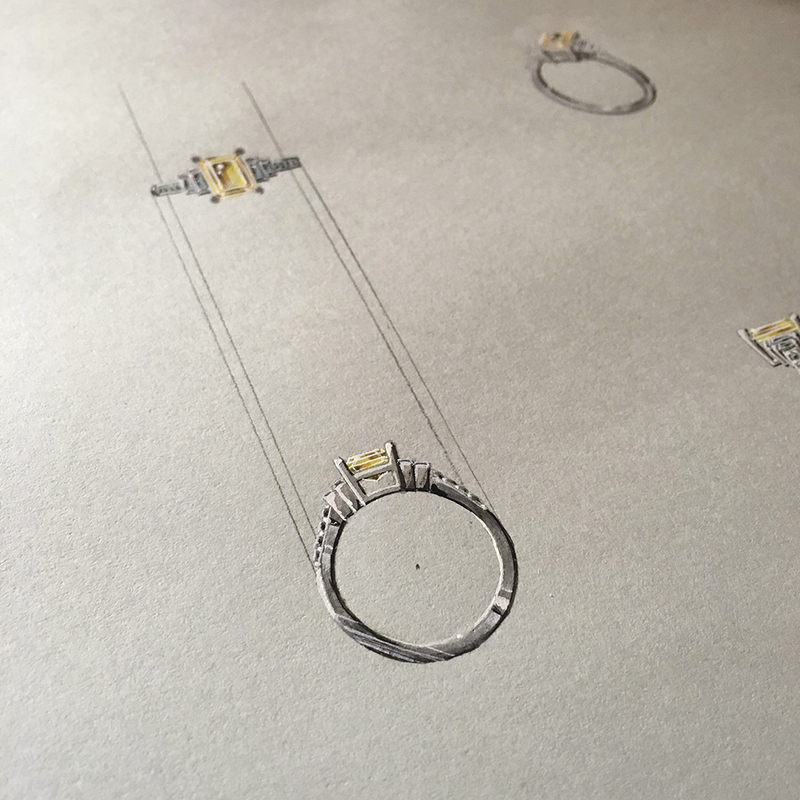 Q: Where should I look for inspiration for my ring design? A: Magazines, Pinterest and Google images are always great sources of inspiration. Save images of engagement rings that you like and once you’ve finished browsing, take a look at the saved ones. This way you’ll see what kind of general styles you’re gravitating towards. The easiest inspiration of all is to look at what style of jewellery and clothing your partner is already wearing. Q: What is more important for my diamond – cut, colour, carat or clarity? A: All four of the 4 Cs are important and you should consider how to balance all four to suit your price point. However, as a rule of thumb, we do suggest ensuring that the diamond’s clarity, cut and colour suit your requirements and preferences first, then consider the carat weight based on your remaining budget. Q: What makes diamonds so popular for engagement rings? A: A diamond engagement ring is considered an iconic symbol of love and unity in 20th and 21st century Western civilisation, and it’s not hard to see why. Every diamond is both entirely unique and incredibly rare. This makes a diamond engagement ring a precious gift, that nobody else will have. 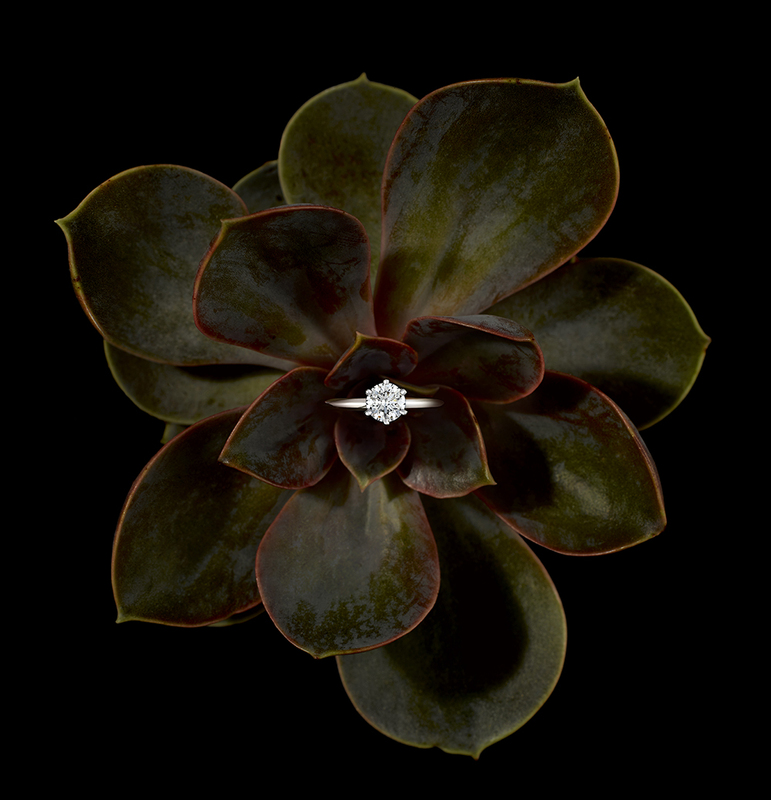 What better symbol for your love and commitment than a diamond formed in the harshest conditions at the heart of the earth? Of course, there is a huge range of coloured gemstones to choose from instead of diamonds, which offer the same timeless engagement ring aesthetic. Gemstone engagement rings that feature sapphires, rubies, emeralds or tourmalines are incredibly on-trend and offer a unique and personalised take on an otherwise traditional piece of jewellery. Q: What metals are recommended for rings? A: We recommend 18ct white, yellow or rose gold and platinum for rings designed to be worn every day. Both 18ct gold and platinum are durable metal choices, as well as boasting a glorious shine that will complement any wearer. Q: How does the bespoke process work? 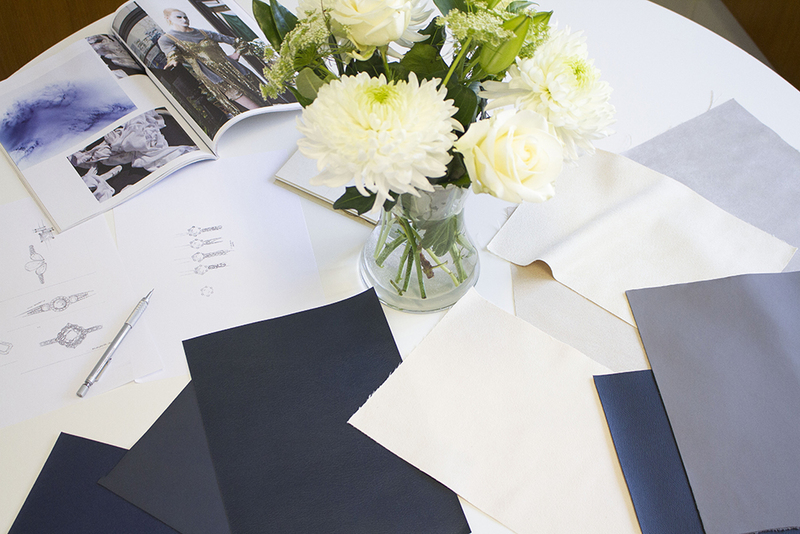 A: The bespoke process is easy. Simply find a design you love from our collection or share your ideas with your design consultant. Once we know what you’re after, you’ll receive a quick quote based on your ideas, requirements and price point. When you’re ready, you can select your centre diamond or gemstone and we’ll use the precise measurements to complete a draft of your design. 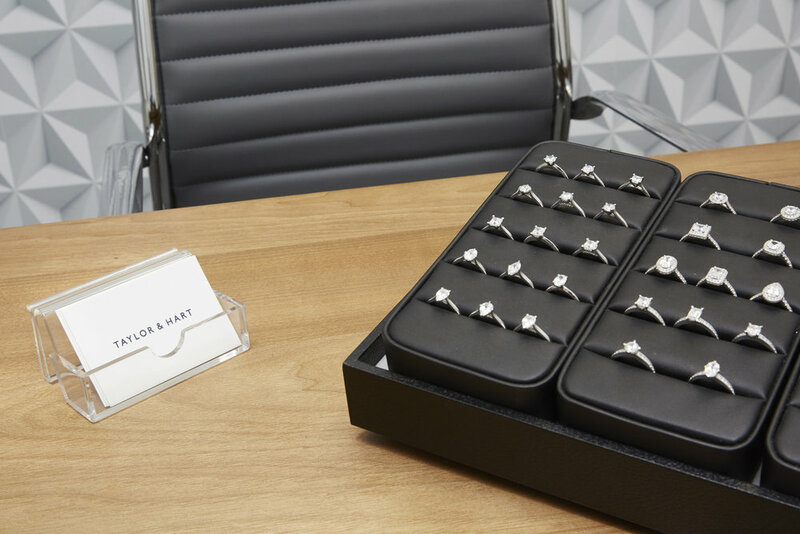 This is a complimentary service, where you’ll be able see a 3D design of your ring. This is the perfect chance to give plenty of feedback and ask questions. Your design can be amended up to three times. Once you’re happy with your design, you’ll receive a final quote, which is valid for up to 14 days. 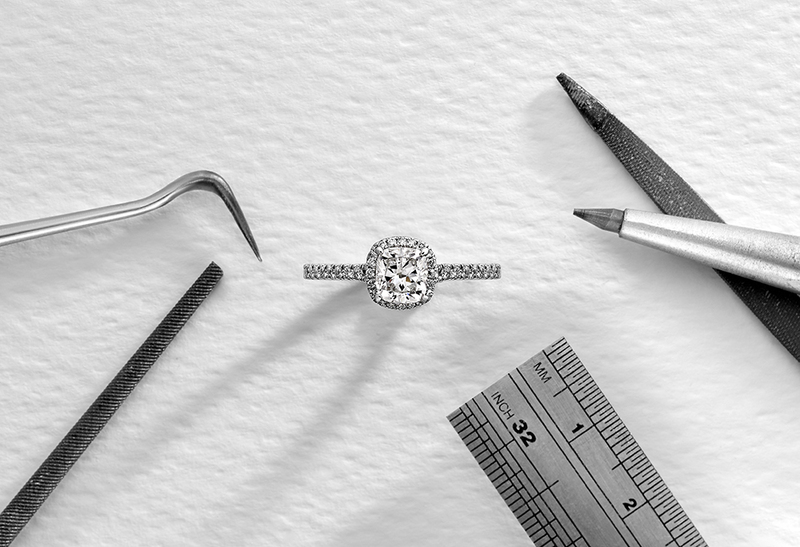 Simply complete the payment online and sit back to leave our master craftsmen to bring your ring to life in just 30 days. Q: What are some unique touches I can add to my ring? A: There are a whole host of customisations that can add a unique and hugely personal finish to your ring. From a small inscription or gemstone set on the inside of your band that nobody will ever see, to having an entirely customised engraved pattern along the entire band – it’s totally up to you! 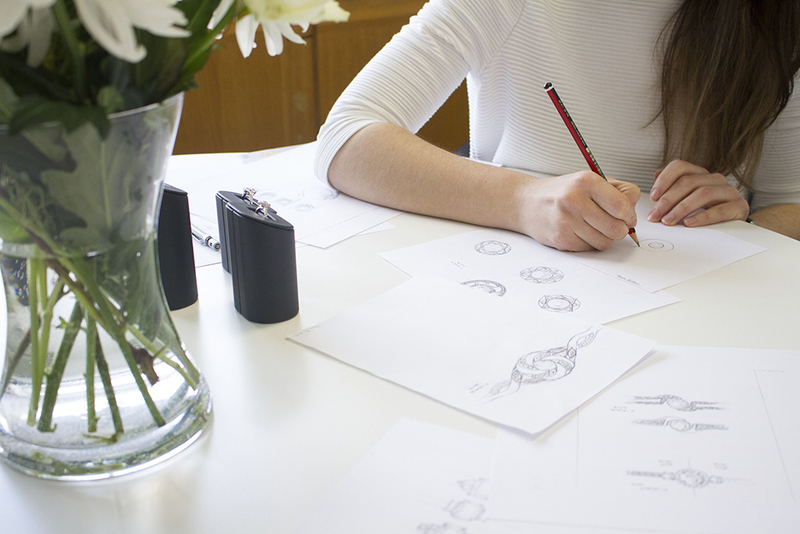 Almost anything is possible when it comes to customising your ring design. Q: What is the timeframe, from initial contact to delivery of my ring? A: It depends on how long it takes you to perfect your final design. 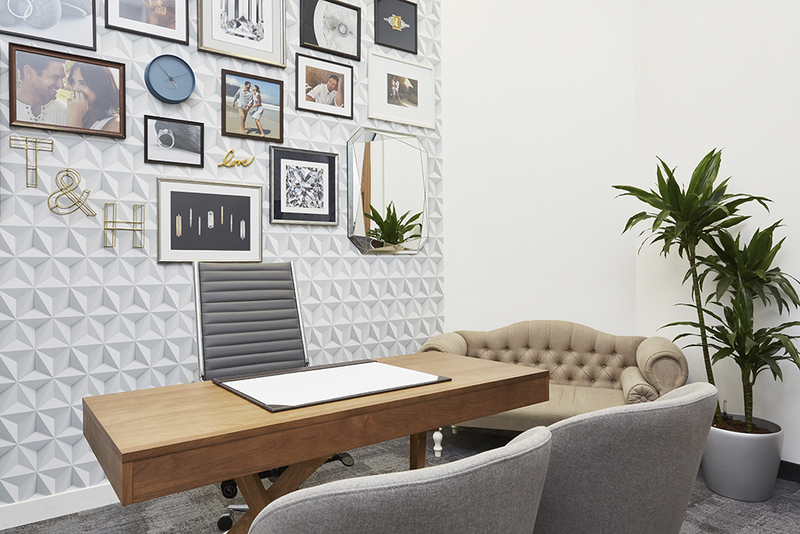 Some people need just a few emails back and forth or a quick phone call while others embark on a design journey that takes months, via phone, email or even in-person consultations. Once the design is finalised and your order is placed, it typically takes 30 days to craft as every item is made to order. For most designs, we offer an express service, for a fee, which will see your ring completed in 12 working days. In some cases where particular materials need to be sourced or stones need custom cutting, the process will take longer, but your consultant will make you aware of this. Q: How should I take care of my rings? A: While diamonds, precious gemstones and metals are not easily damaged, they do require frequent care. You should avoid wearing your ring during physical activity as this risks damage. You should also remove your ring before coming into contact with household cleaning products (bleach, furniture polish etc.) or abrasive liquids (hair dye or paint). We also recommend cleaning your ring once a month as it’s worn on a daily basis. Rings collect build-up from showering, hand wash and common cosmetics such as moisturisers, makeup or perfume. It’s best to have your ring cleaned professionally at a jeweller once a year. You can clean your ring at home with a small drop of washing up liquid, gently scrubbing with a soft, clean toothbrush. Simply rinse the ring under warm water, scrub to remove any further soap residue, and dry with a microfibre cloth. Q: What makes Taylor & Hart unique? A: We’re storytellers at heart. Every single one of our customers has a love story to capture in the form of this incredibly special item of jewellery. And we’re here to make it a possibility for them. Q: How do you stand out from your competitors? A: We are known for our outstanding service and for building a ‘jeweller for life’ relationship. The jewellery our customers buy and wear acts as a talisman, an anchor that helps them fondly recall the memories of special moments in their lives. We believe that expertly crafted custom jewellery that symbolises your style and story should be accessible to everyone who wants to declare their love. Taylor & Hart has a tech-enabled customer journey, sales process and the manufacturing capabilities to work with you, every step of the way. We allow you to create a high-quality personal piece of jewellery, at your price point, in your way. The combination of tech innovations and personal service allows us to provide the best of online and best of retail. You get the convenience and value of online shopping, with the assistance of buying in-store thanks to our highly personalised service via phone, email, Whatsapp and even at our London showroom. Another big differentiator is the freedom we offer to our clients in the way they shop and in the products they can purchase – freedom to shop online or visit a showroom, freedom to choose a pre-designed ring or start from scratch and create a unique bespoke ring, freedom to communicate in the way you prefer and get a 24/7 client-lead shopping experience. 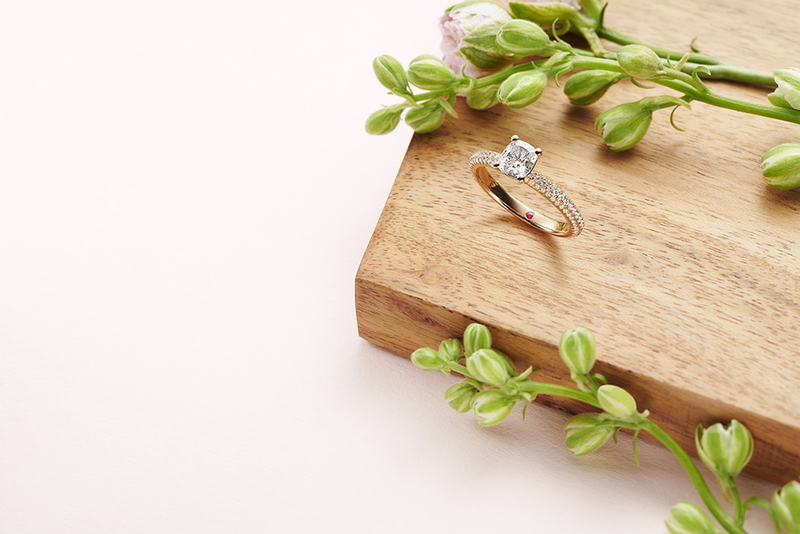 ‘We believe engagement and wedding rings aren’t just a treasured gift. They’re symbols of a relationship, how two people came together and fell in love. 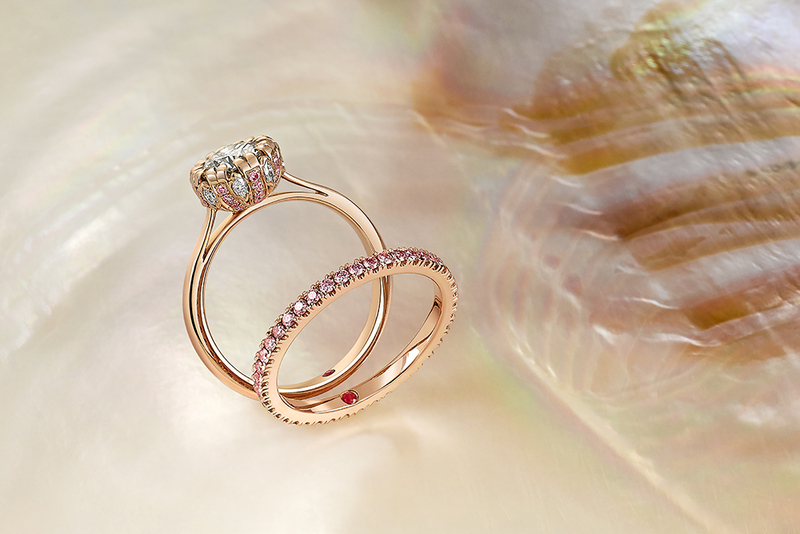 Rings that capture your story. 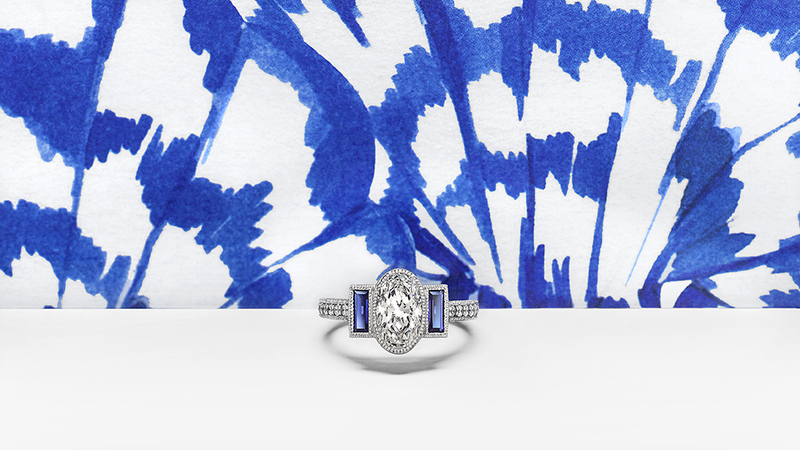 Our years of experience have taught us that jewellery shouldn’t be about compromise. Created from the finest metals and ethically sourced precious gemstones and diamonds, our rings are exceptionally crafted, at a fair price. How do we do this? Based in the City of London, our design consultants work with you to capture the little details in a ring that celebrate your love. A ring no one else will be wearing. You can visit our welcoming showroom to see ring samples, discuss ideas with your consultant and ask any questions you might have. Alternatively, you can speak with your consultant via email, phone, video chat or even WhatsApp!